Latest Update: 4/17/19 - Trail Hazard Alert! Urbana, OH - "There will be scheduled maintenance on the SKT on Friday, April 19th and possibly continuing into the week of April 22nd, or until done. "There is a temporary closing of the Northern section of the Simon Kenton Trail at the SR 296 intersection. Contractors are installing new RR warning lights and a gate for that crossing..."
"In the event of inclement weather during the planned workdays, the project may need to be extended into the next week until completed. Urbana, OH - "...We are 'Over the Top' on the Honda of America paving challenge with a final amount donated by the November 30th deadline of $30,250. Bellefontaine, OH - "...For each dollar we raise through donations and fund raisers by November 30, 2018, Honda will match it dollar for dollar. Bellefontaine, OH - "@ 2.3 miles from the Carter Avenue trailhead in Bellefontaine to TR 199 were chip sealed on sub contract by the Logan County Engineer's Department. OB: The new pavement, called 'chip seal,' is a lower cost option compared to finished asphalt. It's not as rough as traditional chip & sealed roads. So far this new surface has been well received by trail riders. 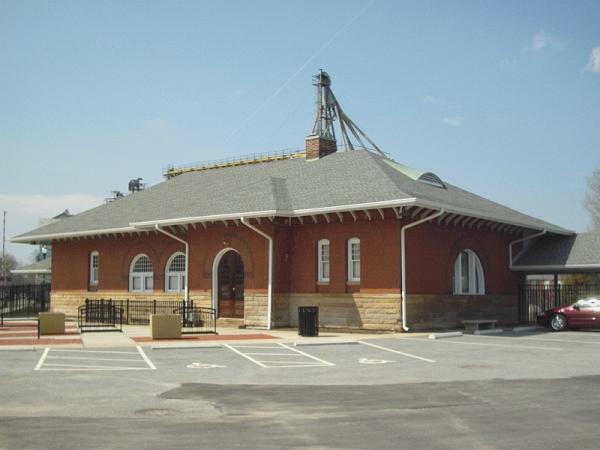 Bellefontaine, OH - From Simon Kenton Pathfinders, "A section of the Simon Kenton Trail will be closed on Monday, July 9th (rain date of Tuesday, July 10th) for paving. This project will temporarily close the trail from Carter Avenue in Bellefontaine to TR 199, South of the city. This closing will include the parking lot at the North terminus. The project is expected to take only one day..."
This chip/seal paving is made possible by an anonymous donor who gave $8,000, provided the SKP could match it which we did .....and more. Thanks to all who contributed. Bellefontaine, OH - Weather permitting, paving of a 1.3-mile portion of the trail will begin in a couple of weeks. This will be the first asphalt laid on the currently unpaved portion of the trail in Bellefontaine. The section scheduled for paving extends from the northern terminus at Carter Road, south to County Road 200. Where this trails splits in Urbana to head towards Bellefontaine at the Depot Coffee House in Urbana, about .5m up the path there is a downed tree across the bike trail. It extends across the path almost to the train tracks. It is still attached at the trunk so I was unable to move it. You will have to walk around it to continue on to Bellefontaine or to finish coming into Urbana. From whio.com, "...The Springfield Police Division is expanding its bicycle patrols to Springfield's greenway trail network. "The Little Miami Trail, Simon Kenton Trail and the east-west connector, Buck Creek Trail will be patrolled by certified bike patrol officers to off-duty staffing from now into early fall, Clark County Combined Health District officials said Friday. " Facilities: No known trailside facilities between Bellefontaine & Urbana. Worth Noting: The SKT's connection with the Little Miami Trail essentially ties it to the SW OH trail network and the cross-state Ohio-to-Erie Trail. Shortly after leaving Urbana and heading north toward Bellefontaine, the bikeway's asphalt surface turns to crushed stone for the remainder of the 16-mile journey. This segment also shares the corridor with a train track, whereas paved trail coming southwest out of Urbana has the corridor all to itself. 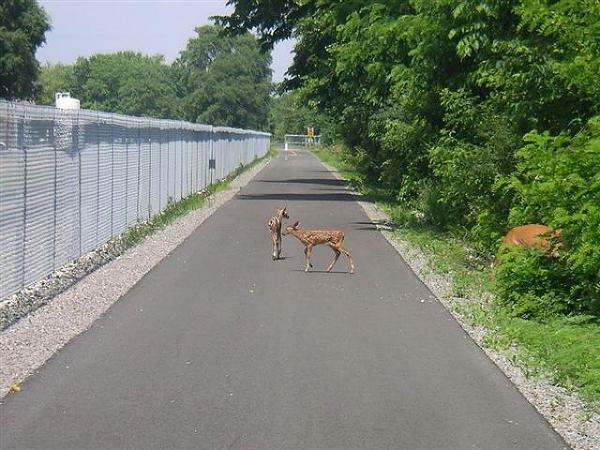 In Springfield, OH the trail connects with the Buck Creek Trail before ending at Center Street, a mere .2 miles from the Little Miami Trail. This final connection, via a protected bike lane, effectively connects the Simon Kenton with trails throughout SW, central and NE Ohio via Xenia Station. The Simon Kenton Trail runs 18 miles from the YMCA in the east end of Urbana, Ohio, meandering west and then to the north, and eventually south to downtown Springfield, Ohio. Mostly flat, it's mainly a rail trail with lots of shady areas and wide open spots too. There are many wildflowers to see and lots of corn and soy bean fields. There are interesting sights along the Trail with much farm land and a few streams to cross. There are plenty of places to stop for refreshments in West Liberty and Bellefontaine. Cedar Bog Nature Preserve is conveniently located nearby on Woodburn Road. Spurs branch off to the Melvin Miller Park in Urbana, the Urbana University, the Springfield Soccer Fields, the Splash Zone Water Park, and the Buck Creek Trail. The Simon Kenton Trail, which has become known simply as the "SKT," crosses over the old 1916 Buck Creek Bridge and it has been connected with trail into downtown Springfield to Center Street where It connects via downtown streets to the Little Miami Scenic Trail. If you like to go fast and enjoy long stretches of trail, then riding on the SKT is just where you want to be.